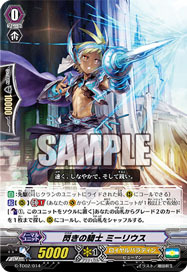 [A] [(V)/(R)]: When this hits a Vanguard with an attack, if if you have a ::Nova Grappler:: Vanguard, look at up to 5 cards from top of your Library and search for up to 1 "Beast Deity, Azure Dragon", reveal it, and put it in your hand. Put the rest on bottom of the Library in any order. The Beast God Army has changed the history of Nova Grapple.